DECENT LOCATION,NEAR AIRPORT.EXCELLENT POOL. DOWN SIDE; ROOMS VERY BASIC. NO KETTLE,TEA OR COFFEE. BATH TOO SMALL LIKE SINK. RESTAURANT BLAND. I have just come back from a superb one week holiday with my daughter, staying at the Irinna Hotel. My friends have stayed in Kefalonia for the past three years and had recommended the island highly. The hotel was fine for us and we have no real complaints at all. The food was ok and was of the self service buffet variety, although not too varied from day to day. The staff serving drinks were efficient and friendly. The eating areas were clean. Our room was basic but nice enough, and all bedding was made on a daily basis and changed a couple of times during our stay. Rooms have air-con which was essential as the weather was lovely and hot while we were there. Also we had a smashing view of the airport to our right which was great when the planes were coming in to land, they fly right over the hotel, very low, Tuesday is the busy day, the rest of the week was fine with only a few. The pool side trees and bushes rustle excitedly once a plane has flown over. You can go on the roof of the hotel to get an even better view, quite spectacular! Outside, the pool area was great, large freshwater pool for all to enjoy and a smaller shallow kiddies pool. Loads of sun-beds, chairs and parasols were available by the pool. I think we beat the real summer rush, as the schools break up about now so the place may fill up a bit more from here on in. A taverna is on-site for lunches if you like, otherwise it�s a ten minute walk up the road from the hotel to the nearest place to eat. Also a raised pool side mini bar is on hand for that early afternoon cooling glass of lager. The main hotel bar is air-conditioned and is open all day till about 2am. The barman is a bit of a cocky so and so but was ok I suppose. Big television in foyer was available. We were lucky enough to be on this holiday when Greece won the Euro 2004 footy so there was a great atmosphere going on in the hotel on the big night and the boys done good so everyone was happy. Svoronata itself is quiet, we got a taxi into Lassi, 6miles up the coast (10 Euros each way). We met up with friends for a meal. We hired a car from Greekstones, up the road from the hotel. Cost was 114 Euros for three days. This was the best thing we could have done as it allowed us to tour the island. Think this was money well spent as we were able to visit such lovely Kefalonian locations such as Sami, Poros, Fiskardo, Assos, Myrtos Beach, Skala to name but a few. The roads are fine and some of the views are quite stunning, I took a shed load of photos whilst there and they will be a superb memory of our holiday on Kefalonia. We (aged 43 and 9) thoroughly enjoyed our holiday at the Irinna. Despite it being half term week the hotel was quiet, the food good, the pool almost empty. 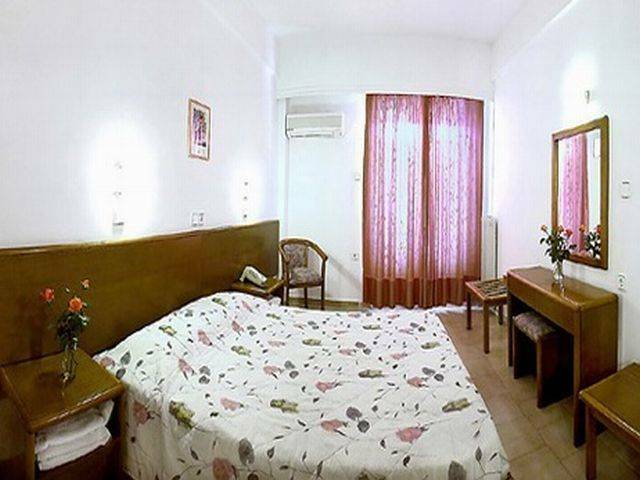 The staff were helpful and friendly and the area was quiet but within easy reach of main town, Argostoli and the resort of Lassi. Definitely recommended for a quiet and relaxing holiday despite the proximity to the airport, flights were an infrequent novelty and not a nuisance at all. I booked this hotel via MedHotels.com for �84 each for 1 week B&B and after doing some serious homework on apartments/hotels etc. in Kefalonia thought we'd deffo picked the right place. The standard of accommodation in Greece as we all know is lower than the UK and lower than Spain, but this place was great value for money with it's 2 pools (1 kiddie), pool bar (9:30-17:30), taverna (9:30-17:30), breakfast room (7:30-9:30) and if you don't like the buffet selection (minimal to be fare) then you can ask for bacon & eggs and it will cost 6 euros for 2 people. The main bar opens 17:30-01:30 and the barman is a very cheeky chappie - watch yourself girls, he's a bit of a looker but not exactly smooth tongued! The head honcho on reception is good for a giggle, knows his stuff and nothing is too much trouble, in fact all of the staff are great and very very friendly, even the cleaners give you a wave and say hello each day and arrange yer pyjams (if ya were them on jols) in pretty patterns!!!!!! 2 floors 2 worry about certainly not a high-rise and plenty of parking spaces too! You can request a fridge which is actually mini bar sized but it does the trick and there is air-con in each of the rooms. Don't use the hotel room phones, cost for 2 phone calls each less than 5 mins 20+ euros! Now, onto the location, if you like planes then you'll love here, they look as though they're going to land on your balcony and the after thrust to slow down (as the runway is oooooo approx. 200 yards long (joke)) hits the trees at the Irinna, it's quite amusing but I suspect if you've got little-uns, despite the facilities being good for them (little park as well as pool) then they may not like the noise. 1st plane is approx. 7am and last 9:10pm but we're talking very infrequent in between those hours! Deffo best hotel/apartments in Svoronata and good base for the whole of the island. Tip for ya tho, try booking independently and then sort your own travel as package deal I was offered to same place was �499 booking last minute my deal was �84 for hotel, �160 for flight but couple we met got their deal for 2 weeks at �250 - so shop around. If you do this, get a hire car at airport for the hol or jump a taxi, won't cost ya more than 3 euros to hotel. Check all tyres on hires cars as very very slippery roads whether wet or dry! My friend and I visited each resort, ok town, on the island so if anyone would like further help/advice other than what everyone else is offered, be glad to help! Ammes is the best Taverna for atmos and location,fab sunsets from here, the waiters are lovely, (1 in particular, little cutie ;-) ). Behind the taverna (it'll be closed for this season now - as we drank the bar dry on the last night) is a pool bar and Mike who runs it is a scream, can't miss him, Greek-Canadian and great for a laugh! Irinna Hotel is fab! I am 19 yr old girl who went alone,and luckily made lots of friends and had a great time. After being home for two weeks,i got on teletext and flew out again,but svoronata was unfortunately full up,so i stayed in Lourdas instead. Svoronata is nice and quiet and fine if you are ok about making your own entertainment.A lot of people find the Island in general too quiet,and svoronata is probably one of the more traditional quiet greek resorts..You still have a handful of tavernas and bars to choose from though. The hotel staff are really nice... the barman is slightly arrogant,does a bad sean connery impression and will keep you waiting for your drink,while he tells you how much you want to sleep with him...but everyone has a good laugh at him! Location wise,I reckon its ideal..your five minutes away from the airport,which you might find annoying with the slight noise,but you will be thankful when your final day isnt wasted on a long coach journey which stops pff at every hotel on the way. Its only 10 mins away from lassi,and a further five to Argostoli. 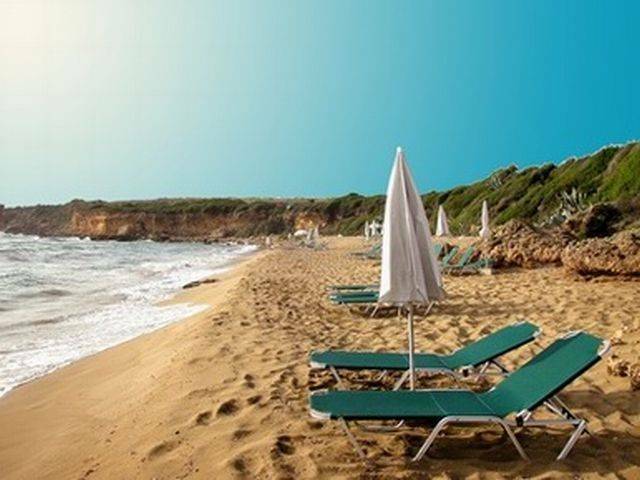 Visit Makris Yialos beach, its gorgeous, and the yellow sunbeds to the left are cheaper.Also go to So Simple,if you fancy drinking in a trendy little bar with good music. Argostoli is great in the evening, go for a meal at La Gondola if you like Italian food, friendly waiters and really comfy big chairs!The greeks normally go out around 12am,so the bars are open till 6 or 7am. Try Cinema and My Way which are in the square. You will see young children playing football in the square until midnight at least,it is really safe and the greeks just sit around and socialise with friends and family.Its really nice to see. Also dont forget to explore the Island... Fiskardo at the top of the Island,wont take you too long in the car,then go to Sammi and see where they filmed Cap Correlli. Melissani lake is a must, and Myrtos beach has been voted best beach in the world, it is stunning! Assos is also worth seeing,its a tiny little greek village,with a small bay. 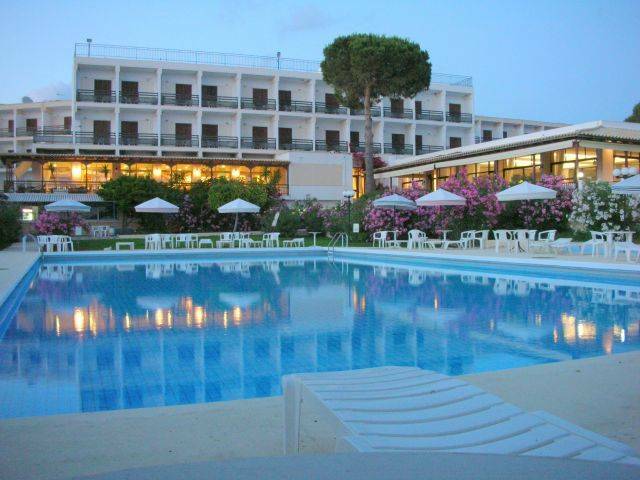 Have a fantastic holiday,if you decide to go to Kefalonia! I have been to svoronata 4 times, the last being 3 years ago. Whilst there I became friendly with Peter, the owner of Porto Helis and the Mini Market. Is it possible to contact Peter - doed he still have the apartments??? we had a really fab time, the swimming pool was very clean all the time, the staff always cleaned it out every morning. The food was excellent and very tasty! The staff were very friendly and we made friends with them. There was two bars inside and outside near the pool. They also had they're own personal cafe. And they served fresh greek salad etc. The location was not bad, but there was an airport close by, but that didnt bother us a bit. If you want to go visit another town the Hotel has their own bus service. Overall it was a very very pleasant holiday and we want to go again! The welcome to the hotel and the island was warm (more than the weather it rained)A very helpful manager tried to please us by showing us several rooms to try to find the biggest bath!!. We excpected facilities similar to England - either a shower or a bath. The combination of a tiny bath (baby size)and a shower hose on the wall proved difficult. However this did not spoil a wonderful holiday. The weather was hot. The staff in the hotel were very friendly. The buffet style food was good value. The tours of the island were excellent (especially the three island cruise) Demetrius's driving terrifying!!!!!!! !The planes flying overhead interesting but they only flew during the day. Altogether a memorable holiday which we can't wait to repeat. PS: I met about 3 couples who have been staying at the Irinna EVERY year for about 20 years! They love the place, love the Island and love the friends they have made over the years. I stayed at the Irinna Hotel for a total of 8 weeks during 2001 and for a week and a half in 2002. Yes - it was a bit basic in some respects but the staff were great! As I was travelling alone, they made me feel like part of the family and I am still in touch with about 3 of them now...probably life long friends! The food in the restaurant is not that great BUT it's pretty cheap and there is a marvellous taverna just up the road called La Calma. I didn't find being in the flight path annoying at all - quite amusing actually when guests experienced a flight coming in to land for the first time! It's close to some lovely beaches, and only 10km to Argostoli - an easy ride if you hire a scooter, which I did for all my holidays. OK - so it's not the Ritz BUT it's clean and tidy, has a nice pool, a reasonable taverna for lunch and an OK restaurant for breakfast and dinner. The staff are LOVELY, it's safe and affordable. What more could you ask for? Gosh I miss living in London....it's a very long way to Cephalonia from New Zealand! The hotel was pleasant but it was in the middle of nowhere.Unless you want this do not go to Svoronata. However it was a good central base to get out and explore the island. The food was Ok if you like the same thing night after night and you don't mind your food being luke warm. 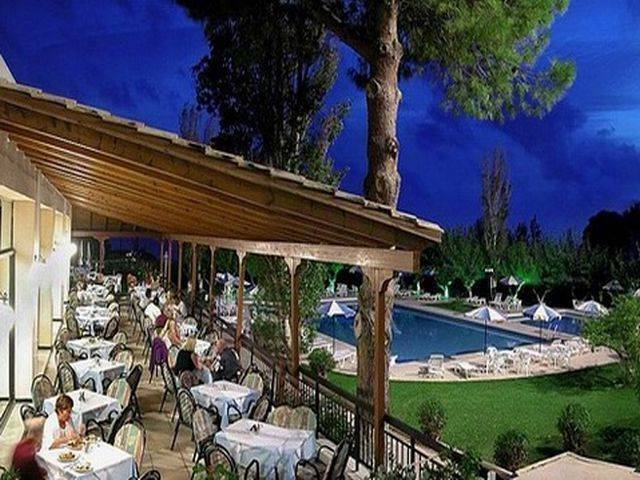 The staff in the restaurant were friendly except when the hotel was full of Greek guests. We were completely ignored until they left. I even had to stop my meal and get up to find a waitress to ask for more drinks. The staff in reception were remarkable. One learnt our room number so we never had to ask for our key. As soon as he saw us entering the reception he had it ready. Being very close to the airport the flights did come very close to the hotel - this was quite exciting at first but them became annoying. They were mainly confirned to the weekend. The first flight is at 6.20am - a good wake up call for breakfast! We stayed at the charming Katerina Apts but used the fantastic pool here. We found it really lovely and although the hotel is in the flight path, the airport is not that busy. When a plane did come over it was very exciting. Only stayed one night - thank goodness. Had the feel of a prison about it! Efficient but very unfriendly. Service slow. Situated 5 mins from airport under the flight path. Don't go there!